Cheap flights to UAE: Abu Dhabi for only €157! JAT Airways / Air Serbia now offer quite cheap flights to United Arab Emirates. Multicity flights Vienna – Abu Dhabi – Paris are available for only €157! 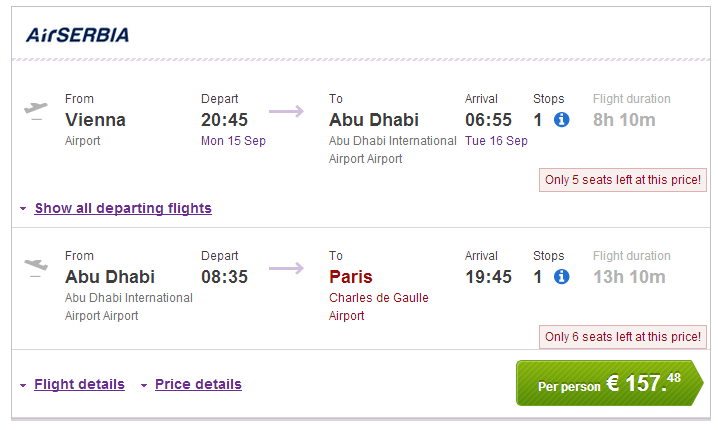 You can also fly from Prague on route Prague – Abu Dhabi – Paris for just €20 more or even from Budapest for €40 more. Book via BudgetAir (click on Show extra search options to enter return to Paris). Abu Dhabi is quite expensive destination full of super luxurious hotels and expensive cars. Check our hotel search engine to compare all booking sites at one and find the best deals. « WOW! Cheap flights to Russia: London-Moscow for only €51!